When choosing a game of poker to play, there are two main things to consider. The variant of poker that dictates the rules which apply to the game and the betting limit structure. We will look at the variants of poker games later but firstly lets take a look at the Betting Limits. Poker Betting Limits: How Much Can I Bet and When? Betting Limits basically just means the betting rules that are used throughout the game. These dictate how much you can bet and raise at any particular time during the hand. Although you can play any poker variant at any betting limits, each one has a particular betting limit that it is more commonly played at and these have been noted down below. 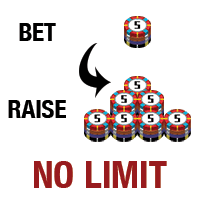 In Fixed Limit poker there are restrictions imposed on the amount that you can bet. All bets and raises must be in equal increments set by the stakes of the table. 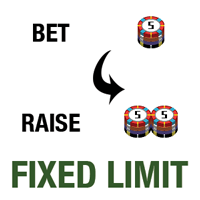 Players cannot bet more or less than the Fixed Limit increment. For example, if a poker game has table stakes of “$1/$2”, all bets & raises must be placed equal to the low-end ($1) or high-end ($2) stakes. The actual amount varies by the particular betting round. In Texas Holdem, for instance, there are 4 betting rounds. For the first two betting rounds, all bets/raises must be equal to the low-end stakes of $1. The last two betting rounds increase bets/raises to meet the high-end stakes of $2. Fixed Limit is most often used in Stud Poker based variants. No Limit poker, as it’s name implies, imposes no limits on the amount a player can bet or raise. The only limit is the total chips a player has at the table. Stakes are still used in a No Limit poker game, but these refer only to the minimum bet and forced bets at the start of each hand. For example, in a $2/$4 Texas Holdem game, the Small Blind (forced bet) would be $2 and the Big Blind (forced bet) $4. The minimum bet/raise would be $4. 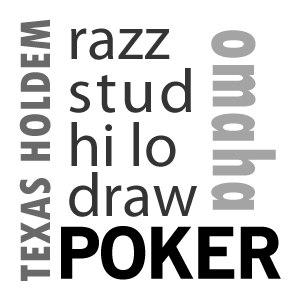 No Limit is most often used in Texas Holdem Poker. 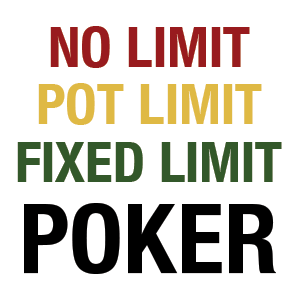 Pot Limit is like a middle ground between Fixed Limit and No Limit. The table stakes refer to the minimum size of bet/raise and forced bets just like a No Limit poker game, but the maximum bet is only limited by the size of the current pot. This means a player can wager up to as much as the pot currently holds but no more. 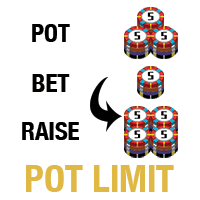 Pot Limit is most often used in Omaha Poker. Poker Game Variations: Help… I Just Want to Play Poker! Poker variants are all based on the same underlying principle of Poker and beating your opponent with a higher ranking hand than they have, however each variant has it’s own rule set and usually very differing strategies and approaches required to win. While there are plenty of poker variations out there, it will get way too confusing to cover all of them. So in this course we will concentrate on the most popular types of poker games. These are the games that you can find being played at most online poker sites and at your local casino. Holdem is by far the most popular variant of poker game. The headline game included in this class is of course Texas Holdem, the worlds most played poker variant. Holdem is played with 2-10 players at a table and a single deck of 52 cards. Each player is dealt a number of “hole cards” which are dealt face down and only that player knows what cards they hold. Then five “community cards” are dealt face up to the center of the table which are shared and seen by all players. The objective of holdem games is to make the best 5 card hand from the cards available to you by combining the hole cards and the community cards. 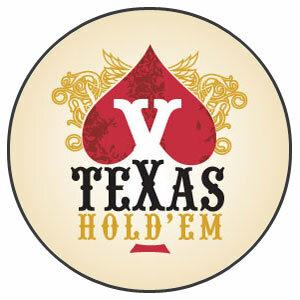 During this course we will teach you the rules to the two most popular holdem games, Texas Holdem and Omaha. Stud Poker is a variant steeped in history and a favorite of many poker legends. Unlike holdem there are no shared community cards in Stud and players can only use the cards dealt to them. Each player will receive a number of cards throughout the hand (usually 7) with some of them dealt face down (hole cards) for only the player to see, and others dealt face up (up cards) for everybody to see. The aim is create a 5 card hand out of the 7 cards dealt to you. Depending on the type of Stud game you are playing you will need to either hold the best ranking “High Poker Hand”, or the best ranking “Low Poker Hand”. Don’t worry about this for now, more will be explained later in the course on the difference between high and low ranking hands. During this course we will teach you the rules to two Stud games, 7 Card Stud and Razz Poker. One of the most interesting ways to play poker is a mixed game where players can participate in several types of poker games at one table. Mixed Game Poker is the ultimate demonstration of skill for a poker player, involving displaying your ability in multiple different poker variants. During mixed game poker, the variant that is played is rotated at regular intervals, so one minute you may be playing Texas Holdem and the other 7 Card Stud. To play mixed game poker, you must be a versatile and experienced poker player as each different variant not only requires different rule sets to be followed but also requires different strategies to be successful. During this course we will teach you the how to play HORSE which is a mixed game consisting of the other 4 variants you will learn on this course, Texas Holdem, Omaha, Razz and Stud. 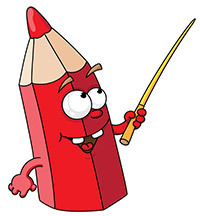 Lesson Review: What have you Learnt? Hopefully that has given you a good introduction to this course and what choices you have to make when choosing a poker game to play. Now it’s time to really get started and look at the foundation blocks of any poker game, and that is the Poker Hand Rankings and what hand beats what. Lesson 2: The Poker Hand Ranking – What are the Best Poker Hands?